Picket planned for Ministry of Highways open house Saturday in Tsawwassen. 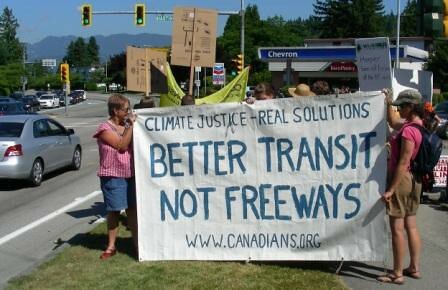 Delta BC: The Council of Canadians Delta/Richmond Chapter calls for improved transit instead of building a multi-billion dollar replacement for the Massey Tunnel. Improving transit is one of the most important ways to reduce emissions, and to give commuters a way to avoid congestion. Numerous studies and long experience shows that highway expansion just creates new bottle necks and wider traffic jams. The group plans to picket and leaflet the Ministry of Highways’ Delta open house on the Saturday March 16 from 10:00 a.m. – 1:00 p.m at the Coast Tsawwassen Inn 1665 56th Street, Delta, B.C.. “We invite others who don't want this tunnel replacement to join us" states Wilander. The province’s proposed replacement of the Massey Tunnel is expected to cost in the neighbourhood of $3 billion dollars. "TransLink has cut bus service to save a few million, meanwhile the province is spending billions on freeways which increase our dependency on cars and tarsands oil," explains Bob Ages of the Council of Canadians Delta/Richmond Chapter. “1950’s thinking won’t solve the problems of the 21st century."